Tabernacle frame. (Italian, late nineteenth or earth twentieth century). Samuel Kress Collection. National Gallery, Washington, D.C. In a continuing series on painting frames, I would like to focus on a particular style: the tabernacle frame. 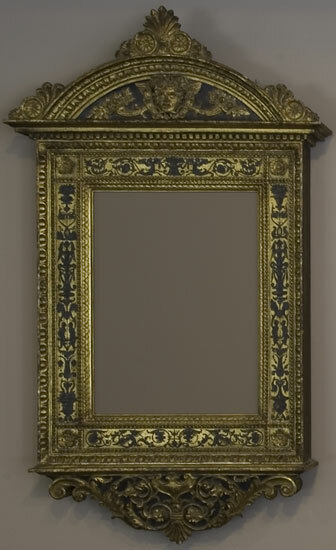 According to researchers at that National Gallery in Washington, the tabernacle frame grew out of devotional paintings. The architectural nature of the frame was meant to imitate the shape of a cathedral or church. As a result, the tabernacle frame was a portable religious site that could be put in a home or other private place of worship. Like a church building, the make up of the frame consists of a plinth at the base and two columns surmounted by an entablature. 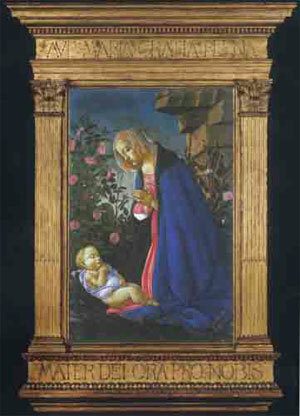 The earliest surviving examples of wooden tabernacle frames are from fifteenth-century Italy, where they were used in religious paintings, especially those featuring the Virgin and Christ Child. Though commissioned by collectors for older works, the tabernacle frame was rarely seen or used on contemporary paintings until the "Olympian painters" of Great Britain, especially Frederick Lord Leighton and Lawrence Alma-Tadema, began using them on their own paintings. Flaming June by Frederick Lord Leighton, P.R.A (British, 1830-1896) as pictured in the Ponce Museum, Puerto Rico. Leighton and Tadema separated the tabernacle frame from its religious context and used it to depict non-traditional scene. Both Leighton and Tadema often designed their own frames, and created unique approaches to the Greco-Roman architecture, especially Tadema, who chose Egyptian themes for many of his works and created frames to match.